Glowing skin is as easy as 1./2./3. For a special occasion or just to pamper yourself try these steps to achieve glowing, healthy skin. 1. 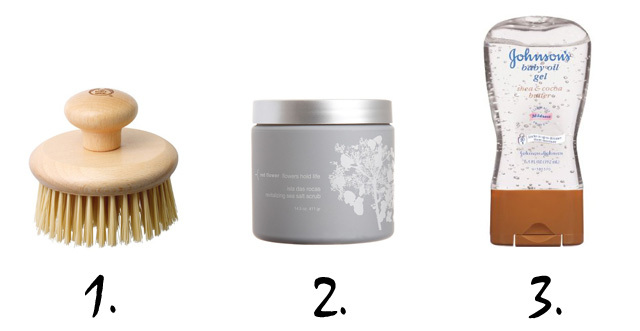 Dry Brush: Rejuvenates, invigorates and rids the skin of accumulated toxins. Brushing the skin helps unclog pores, increase it’s ability to absorb nutrients, increase circulation to the skin cells resulting in a better metabolic cellular exchange and correct problem areas like cellulite. Healthy skin needs to breathe. Rid it regularly of dry skin cells and the body will react by producing new skin cells more rapidly. Your skin will immediately loose that dry, pasty appearance and feel silky smooth. ▶ Starting at your feet, brush in small circular motions. All skin brushing movements should be focused towards the heart, this will encourage blood circulation and lymphatic flow. Apply very light pressure in areas where skin is thin to avoid broken skin, rashes, or irritation. 2. Sea Salt Scrub: Sea salt, derived from evaporated seawater, is chock full of minerals and nutrients beneficial to the skin: magnesium, potassium, calcium chloride, sodium and bromide. These nutrients activate the circulatory system, nourish the skin, soothe the nerves and decrease arthritic discomfort. A good sea salt scrub can breathe new life into tired dull skin. ▶ Gently massage the salt scrub into the skin. Again, start from the feet and work towards the heart. Let the scrub rest on your skin for a few seconds to all allow all oils to absorb in the skin. If you can tolerate it, alternate between warm and cool water to really boost circulation – always ending with the cool water. Favorite: red flower Italian Blood Orange Isla Das Rocas Revitalizing Sea Salt Scrub The fresh scent of orange blossom, grapefruit, lime and orange rind offer instant spa-esque invigoration. Key ingredients include: Salt crystals (harvested in the islands on the south atlantic coastline) unrefined and enriched with health-enhancing minerals / Sea algae, a protein and vitamin rich anti-oxidant / Aloe vera, naturally cooling, healing and moisturizing / Botanical essential oils, fresh and purely scented and certified organic oil.